I love the way Wolf and Max are so intent on the nibblies Excellent shot! Mine S P Hunt is posted. I love this picture. I was thinking about your Dad last night. Wolf is the most beautiful dog I have ever seen….Great photo! I’ve joined the scavenger hunt…my photo is up! Are all those pictures of your pets? What a beautiful assortment of animals! Oh that photo is great ! Did your dad give in to those faces? Looks like they’re both eating some pancakes! Great shots! The top one is funny. Those dogs look ready to take matters into their own paws. Lots of dog lovers in our group! I really enjoyed your pictures this morning. Wolf really does look like a wolf…he’s a beautiful dog! That is something I can’t stand…. 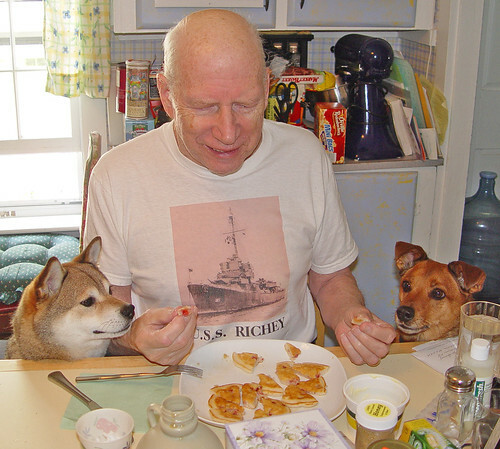 When my dogs beg at the table, I go nuts…. Your Annie and my Mouse look alot alike! That is such a great photo. I love the dogs’ intense focus on the snacks. Adorable. And they are both gorgeous dogs. The at table photo is priceless. What kind of dog is wolf? TOOOOOO CUTE! I’d say the chances of him finishing his breakfast in peace are SLIM and NONE!! LOL..Great photo, though. oh look at that, I think they are going to get spoiled. Mines up too. Awww I just love that shot with your Dad!! Absolutely precious. That picture really makes me giggle! I love it. These are GREAT pics!!! Too funny! Nice photos of your pets. You are an animal lover? That makes me hungry for pancakes. I don’t think I would be as generous with my breakfast in the same circumstances. Looks like a regular old pair of beggars. I’ve got a pair too. Great shots all of them! Wolf is very beautiful! Thanks for sharing! Thanks for stopping by my on Saturday! I hope you have a magnificent Monday! Awww…how precious! You know Wolf and Max were very excited to be getting such a wonderful treat.